ABCF1 antibody recognizes ATP-binding cassette sub-family F member 1, also known as ATP-binding cassette 50 (TNF-alpha stimulated), ATP-binding cassette sub-family F member 1, TNF-alpha-stimulated ABC protein and TNFalpha-inducible ATP-binding protein. Rabbit anti Human ABCF1 antibody recognizes ATP-binding cassette sub-family F member 1, also known as ATP-binding cassette 50 (TNF-alpha stimulated), ATP-binding cassette sub-family F member 1, TNF-alpha-stimulated ABC protein and TNFalpha-inducible ATP-binding protein. The protein encoded by ABCF1 is a member of the superfamily of ATP-binding cassette (ABC) transporters. ABC proteins transport various molecules across extra- and intra-cellular membranes. ABC genes are divided into seven distinct subfamilies (ABC1, MDR/TAP, MRP, ALD, OABP, GCN20, White). This protein is a member of the GCN20 subfamily. Unlike other members of the superfamily, this protein lacks the transmembrane domains which are characteristic of most ABC transporters. This protein may be regulated by tumor necrosis factor-alpha and play a role in enhancement of protein synthesis and the inflammation process (provided by RefSeq, Jul 2008). 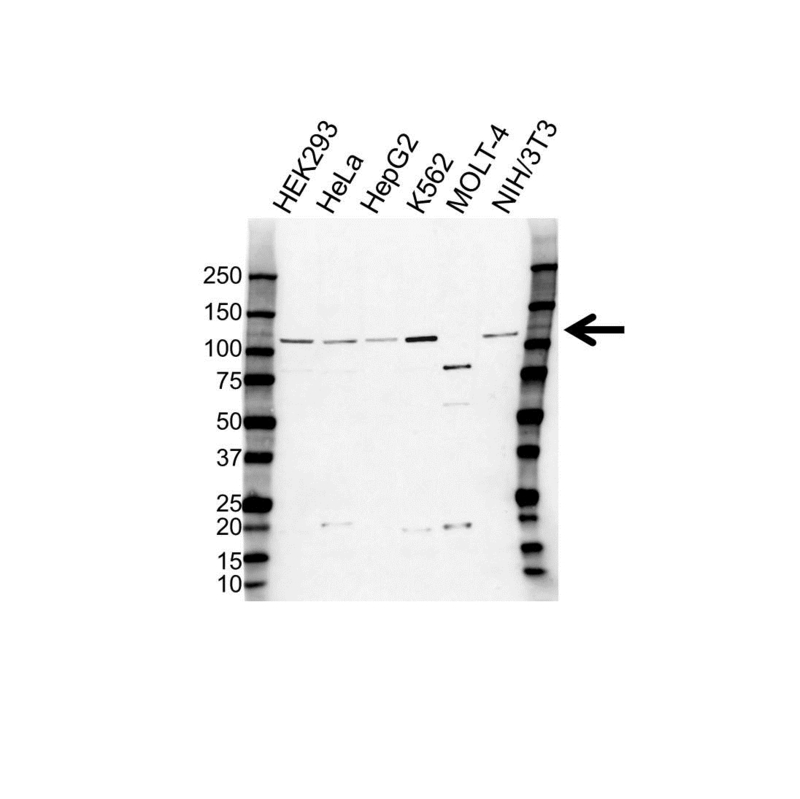 Rabbit anti Human ABCF1 antibody detects a band of 110 kDa. The antibody has been extensively validated for western blotting using whole cell lysates.